Palmdale Mayor Jim Ledford presents house keys to Salvador and Natasha Almanza who purchased the first of the City’s rehabbed homes through the Homeownership Assistance Program. 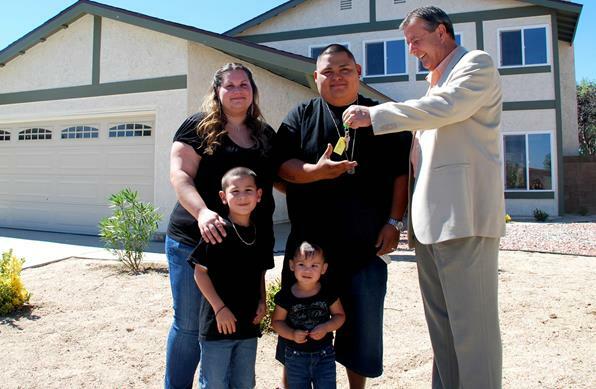 PALMDALE – New homebuyers Salvador and Natasha Almanza were symbolically handed the keys to their new home, recently, by Palmdale Mayor Jim Ledford. The Almanza family purchased the first of the City of Palmdale’s 14 rehabilitated Neighborhood Stabilization Program (NSP) homes, which were put on sale recently through the City’s Homeownership Assistance Program (HAP). “I’m proud that the City of Palmdale, working in partnership with HUD, is able to turn blighted properties into beautiful homes and help families like the Almanza’s achieve the American Dream of home ownership,” Ledford said. The City’s NSP and HAP program is designed to provide low and moderate income families with a loan for closing costs, and the amount needed to meet the government’s affordable monthly housing cost guidelines, when they purchase NSP assisted property. The City of Palmdale purchased 33 homes under the program. At a drawing held earlier this year at a Greater Antelope Valley Association of Realtors meeting, seven realtors were selected to handle the first round of listings. Most recently, an additional three realtors were selected to list additional homes. A reality that came just in time for the Almanza family. The Almanza family’s new home has four bedrooms and 2 ½ bathrooms, a welcomed change from the two-bedroom apartment they once occupied. She said she’s also grateful to many others who worked tirelessly to assist the family in purchasing their first home, including Terry Roscoe from the City of Palmdale, Tamara Stoebe, of Prudential Troth Realtors, Rodney Jacobson of Platinum Home Mortgage, and the Oasis Christian Church. “This program has a lot of paperwork and approvals, but when you do everything right, it’s well worth it at the end of the day,” said Natasha Almanza. The Neighborhood Stabilization Program is funded by the U.S. Department of Housing and Urban Development (HUD) for the purpose of assisting in the redevelopment of abandoned and foreclosed homes under the Housing and Economic Recovery Act. HUD has allocated $7,434,301 of Neighborhood Stabilization Program (NSP) funds to the City of Palmdale. The City has purchased and rehabilitated homes that have been abandoned or foreclosed upon, rehabilitated the homes, and is selling the homes to qualified low and moderate income families. Property lists and agent contact information is available on the City’s Web site at www.cityofpalmdale.org. For more information on the City’s NSP and HAP programs, contact the City’s Housing Division at 661-267-5126. 3 comments for "Family receives dream of home ownership"
Natasha, I am going to be applying for this program and would like you to contact me via email to answer my questions on this program since you are a success story. Thank you! needed to add a few more special thanks … Don Gravois Sr. @ LeBon Appliances, my dad & moms( Homayun & Dale Sabbaghi, Vickie Sanders ), family , & friends that supported, prayed, or helped us. We love you all.